Released on: J&R Adventures. Release date: Available now. Seriously, what do you really need me to tell you about Joe Bonamassa? If you're into traditional blues, with a more rockin' twist, then chances are, Joe's the guy for you to check out! Regular site readers will know all too well exactly who this great guitarist / singer is, who has a phenomenal career as a solo blues rock artist as well as being a joint lead vocalist in the hard rocking Black Country Communion band, alongside some strong names right there. On this new album, as usual, Joe has pulled in a few guest players. Aerosmith’s Brad Whitford helps out on guitar a little here and there too, great drumming from seasoned player Anton Fig too. Bass duties are divided between Michael Rhodes and Carmine Rojas and even Pat Thrall (Pat Travers, Asia, Hughes / Thrall, Meatloaf) steps in on one track as well. So let’s get to the review off this, the man’s tenth solo studio album and just what does ‘Driving Towards The Daylight’ bring the man’s fans? Put simply, another slick piece of work from the man! ‘Dislocated Boy’ is a good strong opener, modern day easy going blues rocker that is simply in a class of its own! From the initial organ strains, to the smooth slick groove it kicks off with before changing here and there, at least three times, even throwing in a little honky tonk piano, it’s just excellent! Next track, the Robert Johnson penned ‘Stones in my Pathway’ is a much more rough and ready blues groover, that’s steady as she goes. Title song ‘Driving Towards the Daylight’ is a beautifully soulful track, that I just can’t get enough of! I could play this again and again and it would never annoy me, it seriously moves me. I love it. You’ll know exactly what I mean when you hear it. Then we get Howlin’ Wolf track ‘Who’s Been Talking?’ even with a spoken Howlin’ Wolf intro too. I love his comment, when asked about how the drums sound, ‘… sounds alright … I want the guy to come in on a calypso beat, you know like …’ and he vocally describes what he’s after and soon enough, the much travelled Anton Fig comes in for Joe, to play just that! It’s a great old classic blues groove, brought right up to date sound wise. Class. It’s a Willie Dixon number next in the shape of ‘I Got All You Need’ and it’s a great upbeat number, with great driving organ work from Arlan Schierbaum (Heaven and Earth, Richie Kotzen, Eddie Money), who to be honest, does a great job throughout the album complimenting Joe’s style. ‘A Place In My Heart’ is a beautifully, soulful blues number written by Bernie Marsden (UFO, Babe Ruth, Whitesnake, Ashton and Lord) and it’s presented in an not unlike Gary Moore blues style. Bernie is and has been a great player / writer for years and I was fortunate enough to see and hear him play with Whitesnake a few times in the late 70’s and early 80’s. Joe just plays and sings this song so smoothly … It’s a pure work of art! An old Bill Withers track ‘Lonely Town, Lonely Street’ gets the Bonamassa treatment next, which is laid down generally with deep heavy riff, but then picks up with a little jazzy funk here and there. Nice stuff, heck even producer Kevin Shirley throw in a little tambourine too! One of Joe’s own compositions is next with ‘Heavenly Soul’ and it’s a more up to date groove for sure and for good measure Joe even throws in some mandolin for good measure. I love Joe's lead break on this, which at times actually reminds me a little of Ritchie Blackmore. Classy stuff indeed! Next Joe picks on a Tom Waits tune ‘New Coat of Paint,’ which is a serious riff fest here and there, while the song maintains its steady pace and vocally it eases back through each verse, but anywhere Joe can, yes, as always provides some spectacular playing. Another Joe written track next with ‘Somewhere Trouble Don’t Go’ and you know as Joe has presented before, he can very often come across not unlike Paul Rodgers and this track seriously grooves with a Bad Company like feel and then some! Final track here is the Jimmy Barnes sung and co-written track, ‘Too Much Ain’t Enough Love,’ and Joe certainly helps to give it a little more soulful presentation. Barnes’ voice here is perhaps a little raspier today than it was when he did this originally on his ‘Freight Train Heart’ album in 1987, alongside Journey players Neal Schon, Jonathan Cain and Randy Jackson (At that time.). 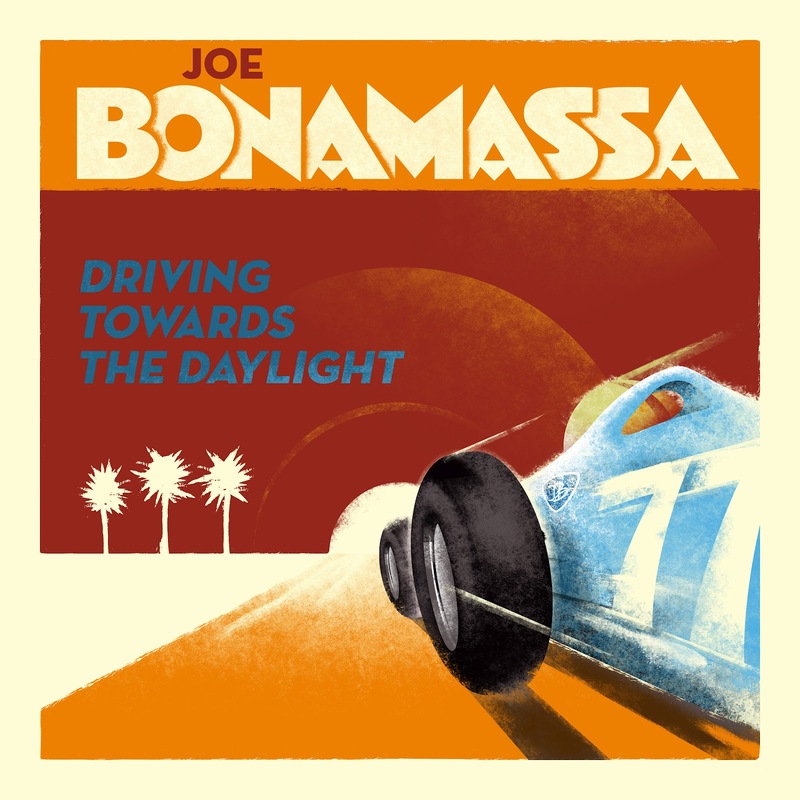 So another great piece of work from Joe Bonamassa and I don’t know quite how he does it, with each album, as frequently as he releases something, that it continues to sound soooo good! For fans of the man, while the songs are more in keeping with the older style blues that inspired him, he really does keep it so fresh! Nice one yet again Joe!